QC pharma jobs offered for b pharmacy freshers in pharmaceutical industry. Usually, first you should qualify an interview exam for attending the interview. It is depend upon the which pharmaceutical company you are trying for. We are not discussing any HR related questions except qc pharma technical questions. Q1. What is room temperature? Q2. What is the Ultraviolet(UV) and visible spectroscopy range? Ans) UV spectroscopy range 200-400 nm, Visible spectroscopy range 400 nm to 800nm. Q3) What is the use of UV Spectroscopy? Ans) Spectroscopy used for detecting the functional groups, impurities. Qualitative and quantitative analysis can be done. Q4) What is the difference between qualitative and quantitative analysis? Ans) Qualitative analysis involves identification of the compound or chemical based on their chemical(absorption, emission )or physical properties(e.g Melting point, boiling point). Q5) Explain the principle of Ultraviolet spectroscopy? Ans) UV spectroscopy uses light in the UV part of electromagnetic spectrum. UV absorption spectra arises in which molecule or atoms outer electrons absorb energy, undergoes transition from lower energy level to higher energy level. For each molecule, absorbance at wavelength is specific. Q6) Explain about Beer Lamberts law? Ans) It states that the intensity of monochromatic light absorbed by a substance dissolved in a fully transmitting solvent is directly proportional to the substance concentration and the path length of the light through the solution. Q7) Explain the Infrared spectroscopy principle? Ans) When a molecule absorbs the Infrared radiation, it vibrates and gives rise to packed Infrared(IR) absorption spectrum. This IR spectrum is specific for every different molecule absorbing the IR radiation, useful for its identification. Q8) What is the body temperature? Q9) Define pH? What is the pH of blood? Ans) pH -Negative logarithm of hydrogen ion concentration. Blood pH-7.35 to 7.45. Q10) Expand LCMS, HPLC,UPLC, TLC and GC? Q11) What is the HPLC principle? Ans) It is a technique used for separating the mixture of components into individual components based on adsorption, partition, ion exchange and size exclusion principles. Stationary phase and mobile phase used in it. HPLC used for identification, quantification and purification of components form a mixture. Ans) It involves solvent system, pump, Sample injector, HPLC columns, Detectors and Recorder. Firstly, solvent(mobile phase) is degassed for eliminating the bubbles. It is passed through the pump with a uniform pressure. The liquid sample is injected into the mobile phase flow stream. It passes through the stationary phase identified by the detectors and recorded. Q13) In reverse phase HPLC, which type of stationary phase is used and give example? Q14) What are the detectors used in HPLC? Ans) UV detector, IR detector, Fluorescence detector, Mass spectroscopy, LC MS etc. Q15) How to calculate Retention factor in paper chromatography? Ans) Rf = Distance travelled by solute/ Distance travelled by solvent. Ans) Number of Number of moles equivalent per litre solution. Q19) Molecular weight of oxygen? Q20) Difference between humidity and relative humidity? Ans) Humidity – Measure of amount of water vapour present in the atmosphere. I have prepared a few more important questions and answers for you. You can also visit additional qc interview questions here. 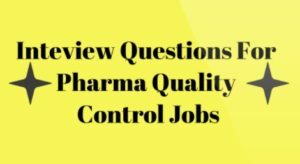 Follow this website for more qc pharma interview questions. If you have any queries comment below.